First of all, Happy Easter! I hope everyone had a great one. One of my biggest stress reliefs is reading. I love to read, anything and everything I can get my hands on. I can spend hours and hours lost in a good book and lately, I've been reading one that has me staying up late it's that good. 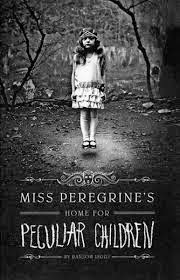 It's Miss Peregrine's Home for Peculiar Children by Ransom Riggs. The first thing I will tell you is this is a series. I tell you this because the series is ongoing. I usually never start books that are series that are still being written because I'm ridiculously impatient and can't stand the wait ha ha. Anyway, this looked so intriguing I really couldn't help but start it. The one I'm reading is the first in the series and once I started reading I couldn't stop! It's about a boy whose grandfather fills him with stories of the spectacular. As the boy grows older he doesn't believe in the stories and even feels upset that his grandfather allowed him to believe the stories to be true for so long. Obviously the stories turn out to be true and the boy goes on some pretty crazy adventures. The neatest part is the book is filled with vintage photographs that tie into the characters in the book. I love vintage photographs and I love that the author worked them into the story. It's a great read with fun pictures to look at along the way! I definitely recommend picking up this book if your on the hunt for a fun read! Let me know if you've read this book and how you liked it.